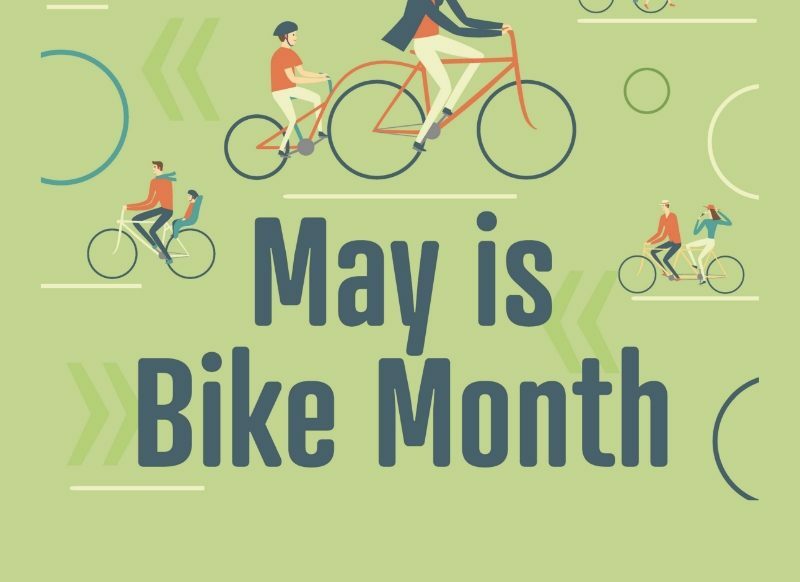 Gear up for May is Bike Month! It’s a good time for returning riders to roll those steads out of the garage and for everyone who rides bikes to celebrate together. Nationally celebrated since 1956, May is Bike Month has been celebrated in Eugene and Springfield since 2014. Bike Month showcases the many benefits of biking and encourages more folks to give it a try. Don’t have a bike? PeaceHealth Rides bike share, celebrating their one-year anniversary, will be offering a month of free rides! Join us at the kick-off event at the First Friday Art Walk on May 3rd (more information below). In addition to a variety of bike art on display, there will be new PeaceHealth Rides unicorn wrapped bikes. We’ll also have information about Bike Month and all the fun events happening throughout the month. #RideWithUs for FREE in May! PeaceHealth Rides celebrates Bike Month with free bike share rides for monthly members. During the entire month of May, new and existing users on the monthly payment plan can ride for FREE up to one hour each day for no charge! How it works – Monthly: As a thank you for being regular riders, this month is on us! Use code BikeMonth19 to get a $15 credit added to your account. You’ll still receive an hour each day, additional time billed at 10 cents per minute. – University of Oregon Monthly: Use code UOBikeMonth19 to get a $5 credit added to your account. You’ll still receive an hour each day, additional time billed at 10 cents per minute. New users can sign up at peacehealthrides.com or on the PeaceHealth Rides app )available for Android and Apple devices). Promo codes are good for new and existing users and can be used throughout the month of May. Just make sure you redeem it by May 31, 2019. For questions, please contact our customer support team at support@peacehealthrides.com or 541-214-2212. May Walk & Roll to School Challenge! We hope you’ll use active or shared transportation every month of the year, but if not, here’s your chance! Bike, walk, skate, scoot, bus or carpool throughout May, or on the special day selected by your school, to meet the May Walk & Roll Challenge! Events vary by school, so check in with your school to find out what’s happening. The Springfield Public Library is hosting an online reading challenge from May 1st through May 22nd. Sign up for free at wheremindsgrow.beanstack.org to participate. Complete challenges to earn chances at prizes! Some challenges either require a visit to the library OR a library card to access certain library services, but this program can be completed regardless of library cardholder status. The bike month reading challenge will appear on the Beanstack website by mid April for pre-registration. Have fun! To celebrate Bike Month we will give you $1 off whenever you ride to any Sky location with 1 or more other riders. LIMIT 1 discount per location per day/ not to be combined with other discounts. Just say RIDE! Ride your bike to Common Bond and receive a free class. First time students only. This is a free introductory class to help everyone feel more confident and safe riding a bike in Eugene. This course will cover the basics of checking out a PeaceHealth Rides bike, special tips & tricks for riding in Eugene, principles of traffic law (and how they pertain to people on bikes), and how to avoid common crashes. This is a great course for new or returning riders and those who want to build their confidence in being able to bike more often. There will also be an educational focused social ride that pairs well with this class that will be held on May 6th as well (see below). Registration required. Mass Bike Ride for Climate! A family friendly, casual, fun, social ride – for Climate. It’s a ride to get more cyclists on the road and help new riders feel safe. We’ll be riding through the streets of Eugene for about an hour ending at a covered area in Alton Baker Park where we can have time for conversation and ideas about how to increase ridership in our town. Come and be part of the culture shift to protect the planet using bicycles as a vehicle for change. Family Friendly: Adults are specifically encouraged to bring their children. To celebrate Opening Day at the Whiteaker Community Market, PeaceHealth Rides is leading a special community group ride! We’ll ride as a group from the EMU bike share station outside of the University of Oregon Bike Program. The route will include multiple stops to highlight the 20×21 EUG Mural Project. We’ll also cover basic bike safety, commuting and riding tips before heading out. The ride will end at the 4th & Blair bike share station by 11 am, just in time to join a free yoga class with Stop, Drop, and Yoga. There will be other fun events to celebrate the start of the season and Cinco de Mayo. Stay as long as you’d like to enjoy the festivities as the return route will be on your own. Thanks for #RidingWithUs! Attendees are encouraged to sign-up for a PeaceHealth Rides account prior to the event. Staff will be on site to support the bike share sign-up process and access to the bikes. The event is free, and attendees will receive two hours of ride credit on their accounts. 18+ : Intended for adults. Join us for a fun and educational ride around downtown and the Whitaker. This ride is focused on new and returning riders as well as those that want to build their confidence in biking around Eugene. We’ll be talking about some basics of bike safety and then riding as a group to build up our confidence and support one another in having fun on bikes! This class pairs well with a Smart Cycling Lunch & Learn being held on May 1st from Noon-1pm (at Claim52 Kitchen also, see above). General: Mostly intended for adults. Kids are welcome though. Come along to Bike Touring 101 and Beyond at the Springfield Public Library. Greater Eugene Area Riders (GEARs), City of Springfield, and the Library are teaming up to present displays, insights, and a presentation on bike touring! A special treat will be a presentation on the Oregon Coast Tour. Snacks, refreshments, and bike resources available. Event is free and open to the public! Our weekly, preschool storytime is bike-themed today! We feature books, songs, rhymes, music, and activities designed to support early literacy skills. After storytime is finished we provide a craft. The formal storytime typically lasts about 30 minutes. Families are invited to stay and play in the library after. Discover all your transportation options for getting to and through the UO campus. Register your bike, get help with route planning (bus and bike), learn about transportation services on campus, and much more. FREE swag! Interested in trying bike share for the first time? Or would you like to join a group ride, but could use a little more information to help boost your confidence? The PeaceHealth Rides team is hosting a FREE weekly series of guided bike rides for new riders throughout May for Bike Month. These events are offered for people interested in trying PeaceHealth Rides in a comfortable, low-stress setting on the path system and safe bike infrastructure. Rides will take place over the lunch hour every Wednesday in May. The rides will start at Kesey Square downtown, then will follow a route along the RiverBank Path. There will be a special treat along the route as a fun thank you to everyone who attends. Join us at one or all four rides throughout the month! Grab a friend and come #ridewithus! Want to go on a bike adventure or learn more about packing for a bike adventure? Join the UO Bike Program and our guest presenters to learn the ins and outs of bike touring in the Pacific Northwest and beyond. Bring your route, gear, and logistics questions! Don’t let a surprise on the trail cancel your ride! Join REI’s expert bike techs for this hands-on workshop addressing the most common trailside issues. Busted chains, noisy drivetrains, and broken spokes are all on the agenda with plenty of get-your-hands-dirty chance to practice along the way. Multiple dates, times, throughout May at Spencer Butte Middle School and Roosevelt Middle School. Check https://www.eugenespringfieldsrts.org/get-involved for details. 4J Safe Routes to School Community Rides. Help 6th graders on a ride around the community. Volunteers needed to keep kids safe. The Springfield Museum will be hosting a “Get to Know Your Bike” event in the Museum parking lot. This event is geared towards children and will feature helmet fittings, bike decorating and safety checks, a raffle, and more. Visitors can also step inside the Museum to check out our exhibit “Freedom on Two Wheels: Springfield’s Bicycling Past”, which will be opening that day at 11 a.m. The Springfield Museum’s newest exhibit, a historical overview of bicycling in east Lane County, will be opening Friday, May 10, 2019 at the Springfield Museum. The exhibit will run from May 10 to June 29, 2019. This exhibit is an exploration of bicycling and its role in the cultural formation of Springfield and rural east Lane County. It will include artifacts, photographs, and other historical items. The opening reception will take place from 5 p.m. to 8 p.m. during the Downtown Springfield Second Friday Art Walk on Friday, May 10 at the Museum. Regular museum hours are 1-4 p.m., Thursday-Saturday. Admission is free! For more information, visit us on Facebook or call 541.726.2300. Round round and around! Bike Around the EMU “O” en masse! Come one! Come all! For an amazing opportunity to create a silly, yet powerful atmosphere by creating a circulating chain of bikes around the O lawn near the EMU. Festive attire is strongly encouraged. Although this ride takes place in an entirely off road location, it is important to pay attention to potential hazards. We will be navigating other users of this shared use pedestrian path. It is essential that participants understand we move at the appropriate pace a shared use pedestrian path can allow (8-11 mph). We will all need to move in a clockwise direction to avoid head-on collisions. Bells and helmets are strongly encouraged. There will be a brief safety talk at 5:30 before launching into our dizzy delirium! I dare you to record this ride on Strava! All are welcome! Please come! Share with your friends! A supported benefit ride for Oregon Supported Living Program. 50, 100, or 150k routes. Join Eugene Velo at the Mohawk Valley Metric Century, presented by Eugene Velo, to help bring affordable and accessible arts education to people with disabilities in Lane County. Discover spring wildflowers in bloom at Bikes to Blooms at Bake Stewart Park! With a local expert as your guide, you’re invited to explore a rare, remnant prairie and oak habitat along Dorena Lake. Bikes to Blooms is a free, educational event featuring activities for families and nature enthusiasts, including a morning bird walk, stewardship opportunities, educational booths hosted by local organizations and guided wildflower walks. Travel southeast of Cottage Grove and experience this ecologically valuable and scenic landscape and to see the southern Willamette Valley in bloom. See full event schedule and information at coastfork.org, CFWWC Facebook page (@CoastFork), or call the CFWWC office at 541-767-9717. Help the UO Outdoor Program and UO Bike Program clean-up the river trails by bike! Bring your own bike or rent one from us beforehand. Fantastic snacks and prizes. Some of our past sponsors have been De Casa Foods, Nancy’s Yogurt, KIND, Brew Dr. Kombucha, and Coconut Bliss! CycloFemme is a socially-driven grass-roots celebration of women on bikes. We are of a growing community, for a growing community. Our annual Mother’s Day ride unites riders, regardless of gender, age, ethnicity or bicycle preference to share in the joy of cycling. Everyone is welcome! Ride with us in Springfield or Eugene on as we Honor the Past, Celebrate the Present, and Empower the Future of Women in Cycling. Both rides will convene in Island Park at the end for a group celebration. Springfield Ride: 1:30 p.m., Willamalane Park Swim Center, 1276 G St.
Eugene Ride: 1:30 p.m., Owen Rose Garden City Park, 300 N. Jefferson St.
Joint celebration at 2:45 p.m. at Island Park (south shelter). We will relax, celebrate, and eat snacks. Don’t have your own bike, but want to join the fun?! Pick up a bike share bike from ANY PeaceHealth Rides Bike Share station. There will be a “special zone” at Island Park since it’s normally out of the system area. This event is free, all-ages. Visit CycloFemme.com for more information on the worldwide celebration. This is a collection of bicycle-related events to get older adults ready and excited for a full summer of cycling. Check out the Facebook event linked above for a list of Campbell Bike Week events. Senior: Mostly focused on older adults. Breakfast at the Bridges is designed for path users and commuters to grab a quick bite to eat and a cup of coffee, meet City staff, learn more about transportation in Eugene, and get a bicycle safety check all at the same time. This signature summer event series celebrates the outdoors and encourages active transportation – especially walking and bicycling – to meet larger City goals, including: healthy living, sustainability and a vibrant business community. Breakfast at the Bridges features local advocacy organizations and local businesses who actively work toward these City goals. This special kick-off event on May 14th will be focused on the Business Commute Challenge! Come back with us to the ‘80s in this presentation and travel behind the “Iron Curtain” with a wandering cyclist, as he experiences machine gun-toting border guards, toxic local beverages and boundless local kindness. Surprise destination: Eugene. Bruce is an inspiring speaker with an approach to cycling, and especially touring, that is easily accessible to beginning cyclists. Bike commuting means different things to everyone, and before you start, it’s important to understand why you ride. This will impact where you ride, how frequently you ride, and what gear you may need. Biking by Campbell Community Center? Bike and you can enjoy a cup of coffee or tea on us. Have you been looking for a bike group to join? Try out the Campbell Bike Group. Riders go 10-20 miles at a relaxed pace. Helmets required. This group is a supportive weekly riding group that is appropriate for beginners and those with physical limitations. The mission of the Worldwide Ride of Silence is to honor bicyclists killed by motorists, promote sharing the road, and provide awareness of bicycling safety. Here in Eugene, we will be meeting at the Churchill Sports Park on Bailey Hill Road, riding in silence past fatal bike crash locations where there are ghost bikes memorializing the crash victims, and ending the ride at the David Minor Theater. This annual open house is your chance to climb big trucks, meet cool people and learn about all the ways that Public Works is active in our community! It’s free, fun and educational for kids of all ages. Register your classroom or group for Public Works Day so we can greet you and provide a tour guide to help you along the way. The registration deadline is May 11. The best time for small groups and families is between 1–2:30 p.m., no registration needed. Flat tires can impact every rider on every surface. If you want to be ready to fix your next flat, join REI’s expert bike techs in this hands-on workshop. From start to finish, you will work through everything you need to know to change a tire. Bring your own bike or practice on one of ours. Recumbents? Tricycles? Hand cycles? Electric assist? Bike Share? Try all these at this bike demo. Try out our amazing fleet of bikes for people who can’t or don’t want to ride standard bike frames. From Jasper Road Trailhead, through town and along the Willamette River, discover how our community is linked by beautiful and convenient paths. We will end up at the Springfield Museum to take in the Historic Biking exhibit, and then linger for lunch if we choose. This family friendly ride is presented by Willamalane and Eugene/Springfield Safe Routes to Schools. Come to Saturday Cuentos for May is Bike Month! Join us as we read Spanish and English language books and play bilingual games, sing songs and do a craft all about bikes! Families who ride their bikes or walk to the storytime will be entered into a special prize drawing. ¡Mayo es el mes de bicicletas! Acompáñenos para Cuentos Sabatinos el sábado, el 18 de mayo, a las 11:00 am para leer libros en español e inglés, hacer actividades bilingües, juegos y canciones bilingües, y hacer manualidades–¡y todo acerca del tema: las bicicletas! Las familias que vengan en sus bicicletas o caminan a pie a la biblioteca puedan participar en una rifa de premios especiales. Families of all ages are welcome! ¡Se invita a las familias con niños de todas las edades! Join Librarian Taylor as she reads a short chapter book aloud while you work on an art project. We’ll spend one to three weeks on a single book, depending on its length. If a book spans more than one week, we’ll start with a review before we get into that night’s session, so never worry if you come into a story partway through! This program is perfect for early elementary ages and preschoolers who are ready for longer stories. Join AARP for a “Bike Fit” class and explore options to get you back in the bike lane. Learn about PeaceHealth Ride Share bikes, and adaptive cycling. Then join us for a short ride with GEARs. If you have one, bring your bike, and don’t forget to bring a friend! Join the Disciples of Dirt to discuss all things related to mountain biking like gear, trails, future rides, and trail work projects. Join Bethel Safe Routes to School and Greater Area Eugene Riders for a community bike ride throughout the Bethel neighborhood. This will a 10.4 mile ride for students that have completed Bike Safety Education in 5th grade and their families. The ride will start at 3:30 PM and end in the Bethel School District parking lot around 5 PM. We will go through protected multi-use paths like the Beltline path, Fern Ridge path and Jenssen path. We will also ride through low traffic streets and cross a few busy intersections with the help of safety volunteers. This will be about an hour and half of fun with the potential of snacks and the smoothie bike at the end of the tour. Students without bikes will have the option to borrow a bike from the SRTS Bike Safety Education trailer. A waiver will need to be signed by students and their parents/guardians since this will be a school district event. Join us for a fun after school event to get to know the Bethel neighborhood more! Family Friendly : Especially encourage students that have participated in 5th grade bike safety education to participate due to the length of the ride. Bike in Shapes is a monthly group bicycle ride and gathering. Pac Man Ghosts, Oregon Maps, Cindy Crawford’s Mole…if it’s a shape, we’ll trace and ride it! Each ride is tapped off with some local brews and old-fashioned community building. 21+: Typically this is because the event takes place in a bar or is focused on adult beverages.